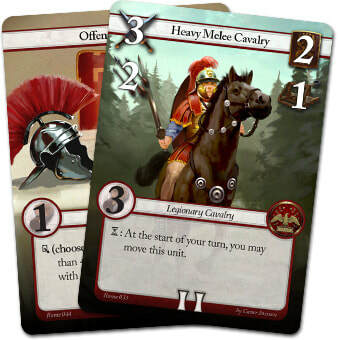 The combat and card mechanics of Burning Rome provides a simple but solid frame to play around with. Once you’ve learned the basics of the game, you can easily start experimenting with various rules and changes. Below I've listed several different ways that you'll be able to modify the rules to fit your liking or play style. Allow the players to use fewer or more points when building their army (e.g. 30 or 60 points). Let each point used to build the army count for 2 Army Strength instead of 1. Change the deck requirement of at least 12 cards to 8 or 16, and/or remove the limit on generals in a deck. Players are limited to start with a max of 5 CP, but at the start of their turn they choose between getting 3 CP + 1 card draw or getting 1 CP + 2 card draws. At the start of a player's turn, they receive 2 AS on top of their choice of CP/card draw. Players are limited to only play 1 unit per column per turn. They may still move several units into a column, just not play them. Auxiliaries aren’t available for the deck building part. Collect all Auxiliaries from the two fighting factions, shuffle them and place them face down as a shared second deck. Both players draw 1 card from this deck at the start of their turn, no matter what else they choose. Players can have no other interaction with this deck. 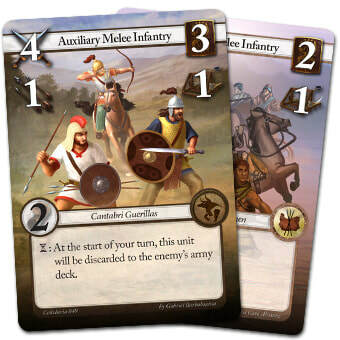 Each player combines two factions when constructing their army deck (e.g. Rome and Celtiberia vs Carthage and Gaetuli). Players must have at least 4 cards from each faction (other limits still apply). Players are only allowed one copy of each card in their army decks. But may include several generals. Before starting a battle, each player may chose up to 3 specific cards from their deck, that they want in their starting hand of 4 or 5 cards. Each player must pay 1, 2 and 3 CP for each respective card the player wants to keep (e.g. keeping 2 cards costs 3 CP). Each player chooses a faction and has to fill their army deck with the following cards: 1 x 0 CP, 4 x 1 CP, 6 x 2 CP and 4 x 3 CP for a total of 28 CP army deck. Furthermore they get 8 CP and 20 AS. On top of the standard army building, each player is given 10 CP to build a tiny reinforcement deck. The player may take this entire deck into their hands on the turn their Army Strength is reduced to 5 or lower. Instead of creating an army deck, players shuffle the entire faction deck and treats it as their army deck. Whenever the players have to draw a card, they draw 3 cards at a time, decides which one to keep and removes the rest from the game. This means that the process is 4 or 5 times 3 draws in the start of a battle. At the end of a player's turn (after attack), they are allowed to either: Discard one friendly unit or They may move one friendly unit to another column.